In Origin, numerical values can be displayed in a worksheet or a graph in various formats. Though the internal values (implemented as “double”) may be the same, showing it is just a matter of “display”, for example either in decimal, or in scientific notation with an exponent. In Origin 2019, the repertoire of the numeric display formats has been significantly expanded to enhance the visual effectiveness and convenience. In this blog, we introduce these varieties of formats in the worksheet column properties with simple examples. Then, at the end of this article, we will touch the custom formats in other places like in a graph. Note 1:The examples in this article are stored in this sample file. Note 2: The custom formats, introduced newly in the coming Origin 2019 version are: 1) Suffix with π and other units, 2) Fraction of π, 3) Improved DMS – Degree angle with minutes(‘) and Seconds(“), and 4) Hexadecimal numbers. 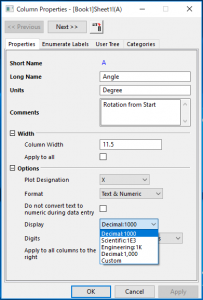 To see or change the current display format of a column, you can double-click the column header (like A(X), B(Y), etc.) to show the “Column Properties” dialog box (above). 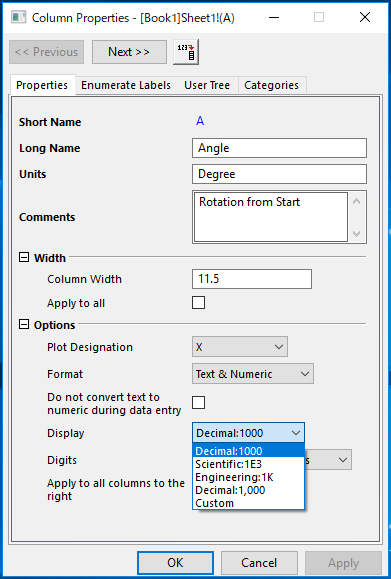 Here, in the dropdown of “Display“, you see 4 standard display formats: “Decimal: 1000“, “Scientific: 1E3“, “Engineering: 1K“, and “Decimal: 1,000“. The first (default) format, “Decimal: 1000” is the decimal format simply with a decimal point. “Scientific: 1E3” is a notation for the floating number with mantissa (before E) and exponent (after E). “Engineering: 1K” is an expression with a “metric prefix” such as kilo(K), mega(M), milli(m), micro(μ). The last “Decimal: 1,000” is same to “1000”, but with thousand separators(,) (in the US style) for thousands, millions, billions, etc. Note 1: In the above example, the value 0.00003456 is expressed in the scientific notation, 3.456E-5 because it goes below the threshold which was set in the “Numeric Format” tab in Options dialog (“Tools> Options” menu). Note 2: In the graph, for the tick labels, there is an additional standard format, “Scientific: 10^3“, a number with an exponent as a superscript like 1.234×103 – another scientific format in addition to “1E3” to display 1.234E+03. We explain each format category below. Note: The list of custom formats and their formal descriptions can be found in this page. You can control the digits in terms of number of digits as well as having the leading zeros. 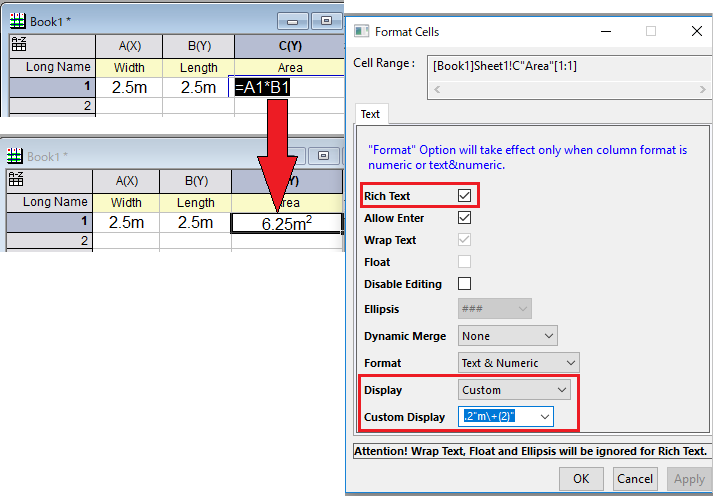 NOTE: In the worksheet, the cell must be set as “Rich Text” to show the superscripted form. Otherwise, it shows the raw string like 2.35×10∖+(1) . Not only having a unit in “Unit” header row of the column, each cell can also show the unit by the display format as a suffix or a prefix. In addition, “%” and “π” are special suffixes which show the scaled values. You can download a sample Origin file to demonstrate these bitwise formats and operations from this link. You can set the display format of a specific cell by right-clicking the cell, and choosing “Format Cells…” flyout. In the example below, the cell C1 has the custom display format, “.2″m\+(2)” to attach an ordinary unit suffix, square meter(m2). 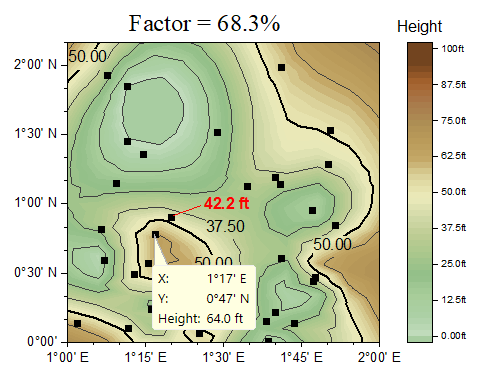 This sample graph contains a scatter plot overlaid on a contour plot, and there are four kinds of labels with custom formats: a) Annotation labels, b) Data Info display, c) Axis tick labels, d) Text labels, and e) Labels on color scale. The notations of formatting elements of these labels are essentially the same for the worksheet column. Here are brief explanations where you can enter the formats. One data point in the scatter plot has an annotation label (“42.2 ft”) specified the number of decimals and unit suffix. When you select the Annotation tool, and double-click the point, you get the default annotation label with the coordinates. Double-click the label to show the Annotation dialog, and you can edit the label notation with the format – in this example, the Z value of the point is shown with 2 decimal places and the unit(“ft”) by the format: $(z,.1 “ft”) . Data point tooltip/Data Info is interactively displayed by simply mousing over the data point, or using the Data Reader/Cursor tool. In either case, the display is highly customizable, and you can use the Custom Formart. In this sample, X and Y are formatted by DM EW and DM NS, respectively. The Z(Height) has the format, .1 “ft” . Here, both X and Y axes have tick labels with “D M EW” and “D M NS” custom format, respectively. 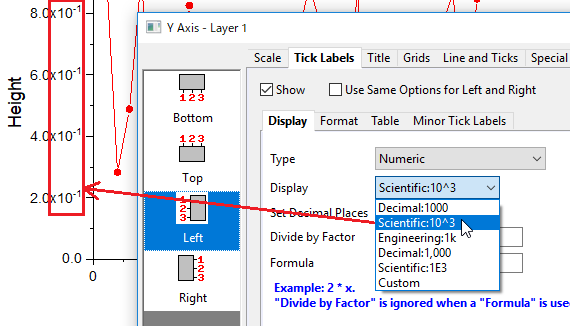 To specify, you can double-click an axis to show the Axis dialog, choose “Tick Labels” tab, choose “Custom” at the Display option, then you can enter “D M EW” for X axis, and “D M NS” for Y axis at the Custom Format field. Note: The details of the %-substitution is explained here. If you double-click the color scale on the graph, it opens the Color Scale Control dialog, then choose “Labels” section in the left panel, you see the “Custom Format” option when you choose “Custom” at Display. In this example, *3″ft” was entered in the Custom Format option to control the significant digits (*3) and the attachment of the unit(ft).